With "global volatility" on everyone's lips, many advisors are recommending investors hold on to their precious metals. Some are even saying now is the best time to buy. But we've also periodically seen the gold and silver markets plunging due to increases in global sell-off. Why is this happening? Why does there seem to be so much confusion in the markets at a time when precious metals appear to be the only shining opportunities for investors with the ability to hedge against inflation? Its failed procedures policies caused the problems to begin with — yet investors still look to these clowns for answers and solutions. Not knowing where else to turn, people have begun to make serious investment decisions based solely on these weekly Fed statements — with little understanding of the bigger picture. Let’s look at the Fed’s recent track record of providing a fix for what ails the economy. Those attempts were coined as measures of quantitative easing, or QE. After QE1 and QE2, we were repeatedly assured there would be no need for future QE events to keep our economy afloat... lo and behold, QE3 was soon initiated in September 2012. During the first two rounds of QE, the Fed purchased $2.3 trillion worth of debt and kept interest rates at near zero for almost three years. Well, it's actually made things worse. Yet, somehow, the Fed wants to apply more of this failed thinking that has kept Japan in the dark for over 30 years. Japan already went down this road and proved this philosophy will not work. Still, the Federal Reserve insists on subjecting our people to more failure. In reality, QE is just another attempt to protect the banks under the guise of supporting the housing market. Truth be told, these elitist banking bastards couldn’t care less about the housing market, since the banks end up with all the property and get either the Fed or the U.S. "Goobermint" to pay for it. While QE was recently stopped, don't think for a minute that the Fed will hesitate in restarting the printing presses. In the meantime, banking executives get huge bonuses for the whole insidious scam while the U.S. taxpayer ultimately gets to foot the bill. What a plan. It's a solid win-win for them and the threat of poverty and loss of all possessions for you. This is the hijacking of America by the elitist banks for the elitist banks so they can get even more power and control. But don’t worry; Americans will keep thinking that something will change and will continue voting for Republicans or Democrats who are bought and paid for by these elitist banksters. Citizens worldwide are going to pay the full price for all this economic and political stupidity. It is not going to be a pretty picture. With the risk of deflation and currency debasement in the United States, and the depletion of precious metals across the globe due to an increasingly insatiable demand, it's almost certain that any sell-off panic will exist only as a short-term trend. For the intelligent few who can see what is truly going on, what is there to do? Given the current prices of our juniors, we want to avoid panic at this point (as demonstrated by a graphic (left, click to enlarge) sent to me by a colleague). This spells it out better than I can describe with words. For now, we have to hold on. 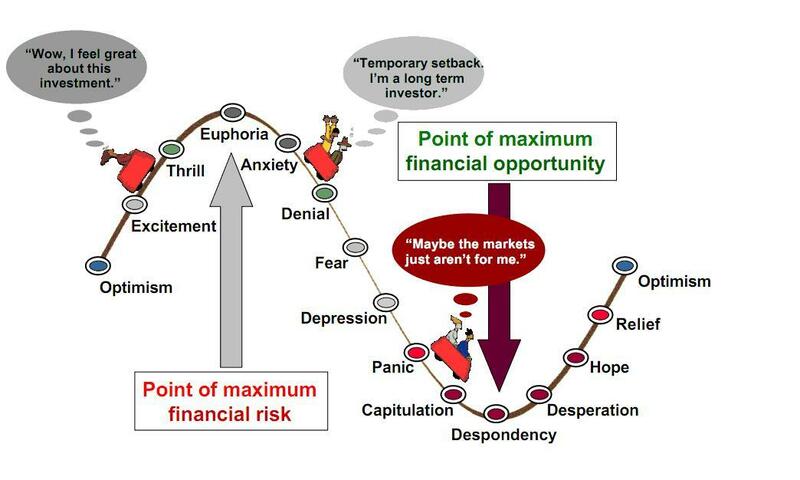 And whatever you do, don’t panic and sell just yet! When prices get too low, that may be your best chance to buy at an affordable rate... hence, why a majority of the big banks have recently gotten very bullish on gold. Things have gone sourly south. Now we must just gut it out. It will get better. There are still safe assets out there. Take another look at that graphic as your guide as to when to buy. When you feel like capitulating and have utter despondency, then you know the time is right to buy. If you are able to do so, these will probably be some of your best buys ever, as I believe our market will recover in a big way. Well, precious metals have just been hit by the downside volatility, which sets us up for a big upside volatility. Remember that, fundamentally, nothing has changed. Governments and their central banks are more out of control now than they were last week, last month, or last year. Investors who don’t know what they are doing are being whipsawed around by these Keynesian jackals as they flee to what is perceived as the next best currency or the next best thing. In the end, the only thing left standing will be the precious metals and their corresponding mining shares as one fiat currency after another implodes worldwide. 'Monopoly money' only holds value if you're playing a game; and this Fed-orchestrated charade is over. The dollar may be 'strong' right now, but that's only because the other options are simply worse. Indeed, the dollar is on top simply by virtue of being the least rotten apple in the bunch. I’ve never said that investing in precious metals and their mining would be easy, but I am on record saying it will be worth it. What lies between now and that moment is plenty of market volatility and all kinds of societal chaos. You simply have to choose — as an investor — whether you want to be part of the slaughter, or be on top of the financial heap as the consequences for decades of economic and political stupidity come to full maturation. Remember, just as the bear wants to go down while taking the greatest number of stockholders with it, the bull wants to advance while taking the fewest investors with it. Therefore, this gold bull will try to shake as many gold investors off its back as possible during its rise. The best way to do that is to violate so-called support levels. Advice: take a gold position that you can sleep with and forget about trading gold. How many times during the previous secular precious metals bull market did we hear of gold’s demise only to have it hit yet another new high? This upcoming bull market is no different — only the volatility is getting greater as we get close to the implosion of fiat currencies worldwide. I choose gold, silver, and the precious metals mining shares for my financial salvation. Perhaps you'll consider a similar approach, now that you understand the truth behind the Fed's lies.